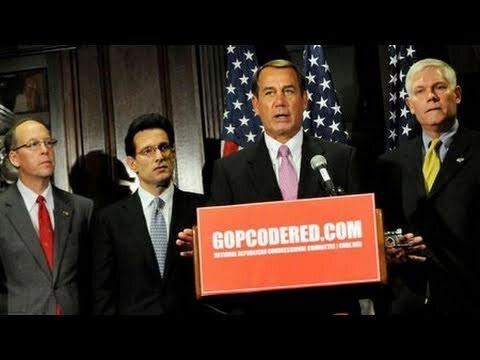 Will Republicans Defund Finance Reform? PAUL JAY, SENIOR EDITOR, TRNN: Welcome to The Real News Network. I’m Paul Jay in Washington. With the Republicans now controlling the House, wither finance reform? Much of the finance reform bill that was passed in the previous Congress is now dependent on regulation and regulators, which need to be chosen and also need to be funded. So how is all this–now that the House is going to have a lot to say about this and it’s a Republican-controlled House, what’s it mean? Now joining us from Amherst, Massachusetts, to discuss this with us is Gerald Epstein. He’s the codirector of the PERI institute and teaches at the University of Massachusetts Amherst. Thanks for joining us, Gerry. JAY: So what’s at stake here? If the Republicans decide that they don’t want to move in the direction that the Democratic-controlled House was moving, what might they do? EPSTEIN: Well, they have a lot of levers. And in fact, they don’t want to implement the Dodd-Frank bill that was passed last July, which in fact had the opportunity to put some real teeth into financial reform. The problem was that it left it to the discretion of regulators–the Federal Reserve, the FDIC [Federal Deposit Insurance Corporation], the Securities and Exchange Commission (SEC), and others to really write the rules, implement the regulation. This was in fact a bankers’ victory, because the bankers knew that they could bring more resources to the table to try to get these rules written in their interest. But at least when the Democrats were in charge of the House there was a fair amount of interest in getting some serious rules written. But now, with the Republicans in charge, they want to undo the rule-writing process what they couldn’t win with the legislation. JAY: Okay, let’s–just to back up a step and put the bill in bigger context, now, we’ve discussed this before in previous interviews, and you’ve had some serious critique about the bill not dealing with the too-big-to-fail and some of the really structural issues, what you and some of your colleagues have called structural blackmail by Wall Street of the American public. But setting that big piece aside, you still thought there were some useful things in this regulation, in this bill. And this is what’s at stake. Even the useful things now may be so watered down by lack of funding and the choice of regulators–. Is–do I have it right? EPSTEIN: That’s absolutely right. That’s the right context. Even with this watered-down bill, they’re going to try to water it down and trash it even more. And among the things that were useful in the original bill were, for example, limits on commodities speculation, using derivatives and other fancy financial products. These limits have to be set and enforced by the Commodities Futures and Trading Commission (CFTC), but they need a lot more staff to implement these. There’s rules against conflicts of interest that the SEC is empowered to implement, but they need more staff to implement these. And what the House is going to try to do and the chairman of the Financial Services Committee there, Spencer Bachus from Alabama, is going to try to do is cut the funding for these regulators so that they can’t really hire the personnel to implement these regulations. They’re going to hold more hearings and have more testimony and to try to delay the process as much as possible. JAY: Now, for them to cut the funding, can they do that without the Senate signing on? EPSTEIN: They can refuse. It’s going to be a political bargaining process. They’re going to bargain these kinds of cuts with the Senate on–with other things that the Democrats in the Senate want more. And so it’s going to be a bargaining process. But this is now going to be on the table where it wasn’t going to be on the table before. JAY: Now, what happens to Elizabeth Warren’s agency? The Consumer Protection Agency I think it was called. Is this affected by this? EPSTEIN: Yes, it is, because this agency doesn’t have an independent financing stream all set up and determined. So–and, also, it doesn’t have a chair. Elizabeth Warren is just an advisor. Again, the House Republicans can come in and say, we’re going to cut funding unless you choose a chair to our liking. And again, none of this is going to be determinative; it’s just going to be part of the bargaining process that the House is going to care a lot about, because the banks are paying a lot of money to congresspeople in the House. JAY: Well, this is one, I think, including you, economists had a critique of this bill, that so much was in the realm of regulations and regulators versus laws. So is this not also partly to blame the Democrats for actually structuring it all this way? ‘Cause, I mean, you always have a situation where a whole different regime could be in power–we could be back to a Bush-Cheney regime someday–and then things that are left as regulations and regulators, as we saw with the SEC and some of the appointments there, the regulations don’t mean anything if you don’t have somebody that wants to effect them. EPSTEIN: That’s right. We and many people, not just people I’m associated with, were arguing for clear rules, bright lines, more structural changes. And the way the regulations were written included almost none of that. It included opportunities for real serious change, but now these–is falling further and further outside of our grasp. JAY: One example is the watering or weakening of the derivatives exchange. What else might be at stake here? EPSTEIN: The Volcker rule, which was designed to try to reduce the ability of banks that have taxpayer guarantee, reduce their ability to engage in highly risky speculative trading for their own accounts, which would threaten possibly their solvency and force more taxpayer bailouts–the Volcker Rule was designed to limit this. And now, if these rules aren’t written very strictly, then the Goldman Sachses of the world will be able to continue making the speculative and risky bets that they always were in the past, and if they get in trouble, then once again, still being too big to fail, they’re going to come to the taxpayers and ask them to bail them out. JAY: It kind of boggles the mind. I mean, it was only, what, a year ago everybody was agreeing this was an apocalyptic moment, the financial meltdown, the casino capitalism of Wall Street. I mean, even Republicans, some were talking this way. How do the Republicans defend this weakening of regulation? EPSTEIN: They don’t. I mean, that’s the amazing thing to me. The Republicans still put themselves forward as this populist, anti-banker, anti-Wall Street, anti-finance party, when in fact they’re right now doing the bankers’ bidding in a way that even the Democrats weren’t shameless enough to do. JAY: Well, the thing is is, as I said earlier, when the Democrats control both Houses, they could have passed something a heck of a lot stronger and not so susceptible to this weakening that’s taking place now. EPSTEIN: That’s right. I agree. JAY: Thanks very much for joining us, Gerald.